This particular Champion 4 is one of American Standard’s best selling one-piece toilet on Amazon. It is packed with great features and well designed for both performance and appearance. It promises a clog-free experience with the Champion 4 Flushing System, which is built to move solid waste at a much higher efficiency than most competitors’ models in the same capacity. One unique feature that exceeds the industry norm has set this Champion 4 toilet distinctly apart from all its rivals. What is this unique feature and how it plays a pivotal role in making this siphonic toilet clog-free? And what are the other features? Is there a round front model? Chair height or standard height option? You need answers, and you will have them all in this American Standard Champion 4 toilet review. Is The Newer 2034.314 A Better Version Than The Old Model? Can You Accept A Little Disadvantage? 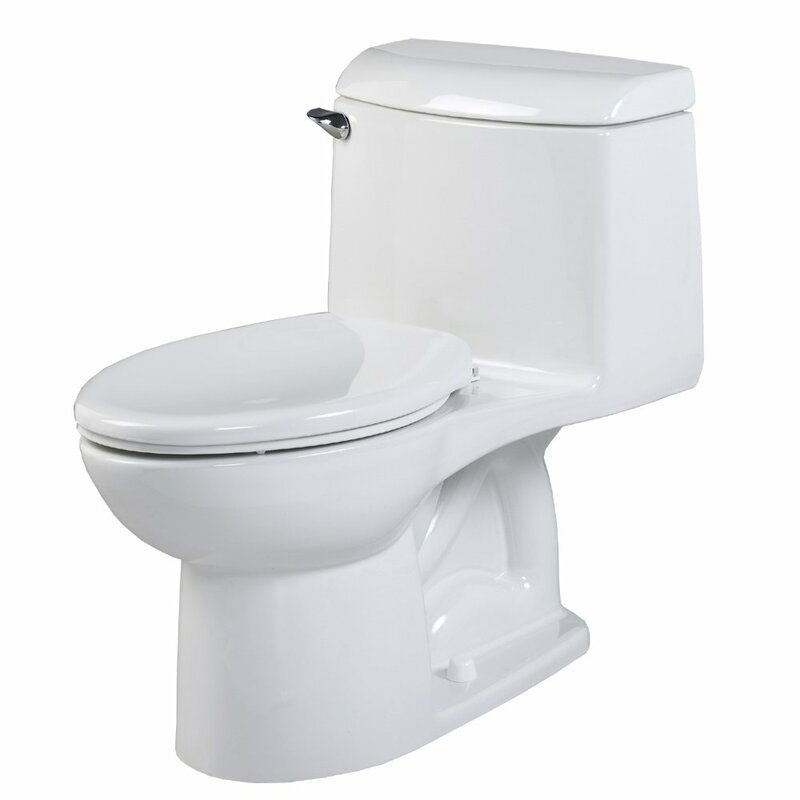 This American Standard 2034.314 Champion 4 toilet is designed to be clog-free. Or pragmatically speaking, the much-dreaded plug, which, unfortunately, is a trait of siphonic toilets, is significantly reduced. And this is achieved through the various features that are uniquely American Standard. The 4″ non-adjustable, piston action Accelerator flush valve is the source of flushing power for this American Standard Champion 4 toilet. Unlike the standard 2 or 3-inch hinged-flapper valve, the flushing power is phenomenal. Without the hinge, it provides no obstruction and allows a lot more water to flow into the bowl, which is desirable. The large water volume results in a high flow rate which offers the inertia power to set the bulk waste in motion towards the trap hole. This water power is further optimized through the siphon jet channel located opposite the trap outlet. It serves to push the solid waste into the trapway and provide the leverage for the siphon to drain out everything in the bowl effortlessly. To move a larger mass of waste, it’s only logical that you need a larger than standard trapway. At 2-3/8″ wide and fully glazed, the trapway of this Champion 4 is 16% bigger than the industry norm of 2 inches. And capable of moving a 70% larger mass than any toilet with a standard size trapway. So if you are not pooping a colossal amount, this Champion of all champions can easily handle the capacity without any hiccup. Even if you produce double of what you usually do, this powerhouse flusher has a MaP score of 1000 grams. That means it can remove a whopping 1 kilogram of solid waste in a single flush. The highest possible flush score by the Maximum Performance Test Lab. Not all glazes are made equal. In the case of this American Standard Champion 4 toilet, it’s a double. Fired right into the porcelain, the double-coated glaze is ultra-smooth and super easy to wipe, and it is permanent. It won’t wear off unless you abuse it with abrasive means. With proper care, it will last a lifetime. Besides, the EverClean surface inhibits the growth of any odor-causing bacteria, mold, and mildew. It prevents dirt from sticking stubbornly onto the surface, and with such flush power, stains and skid marks are hard to form. You will always get a clean bowl with every flush and never have to worry about odor the next morning. A clean flush should include a good bowl cleanse. Despite without the PowerWash Rim the cleanisng power of this Champion 4 (model: 2034.314) is commendable. You can imagine what is like if they were to use the PowerWash Rim on it. But why don’t they include the PowerWash Rim? Is it because of the cost? Or the flushing is already too powerful and efficient so no need for the PowerWash Rim? Seriously, you need to understand the “development” history of this 2034.314 one-piece model. You will find out real soon. While the features and specifications may look decent for this Champion 4, the reviews on Amazon aren’t that enticing. So if you are one who relies heavily on Amazon reviews to make sense of your purchase decision, it’s understandable that you think this review contradicts with the not-so-glorious rating on Amazon. At the time this review post was written, this Champion 4 crapper scores an average of 3.8 stars with only 36 customer reviews. The star rating may not cut it if you only accept a minimum of 4 stars rating and over 60% of the reviews have to be rated 4 and 5 stars. So this current Champion 4 model (2034.314) might fail in your assessment. And as usual, you will see contradicting opinions among the reviewers even with a much higher rating. But that’s not the point here. Before you disqualify it, please have a look at the rating of an earlier (now discontinued) model. That’s where the conflict lies. You will notice the previous model has a much better rating with more than 150 customer reviews. If you are not careful, you might take it as the current model. The model number is a slight variation from the current model. And yes, this 2034.314 model replaces the previous 2034.014 model. What has it got to do with the rating of the current Champion 4 toilet? Pretty much in every way you should include the reviews and ratings of the previous model. That’s because both are the same toilet. Well, don’t be. Read on, and you will see why the reviews and ratings of the old model are as relevant as the new one. You may be thinking since it’s a newer version, it should have better and improved features. Or maybe the new features aren’t that great that’s why it is not getting a higher rating. There are no new features or improvement with the current 2034.314 model. It’s an American Standard thing; they just change the model number. It is the same toilet, old or new. The two toilets have the same features, specification, and dimensions. Even the flush valve is the same 3280.040-0070A (4-inch). Except for the model number, nothing has changed. Which also explains why they are still able to sell you the discontinued model. You should not be too concerned if you have bought the old model. And if you really like this toilet, your only decision is the price. So do your due diligence. But you should get the current model even if the price is the same. That’s because the current version comes with a slow closing seat. The previous model does not. You may want to compare the specs of the new and old Champion 4 with their respective spec sheet. 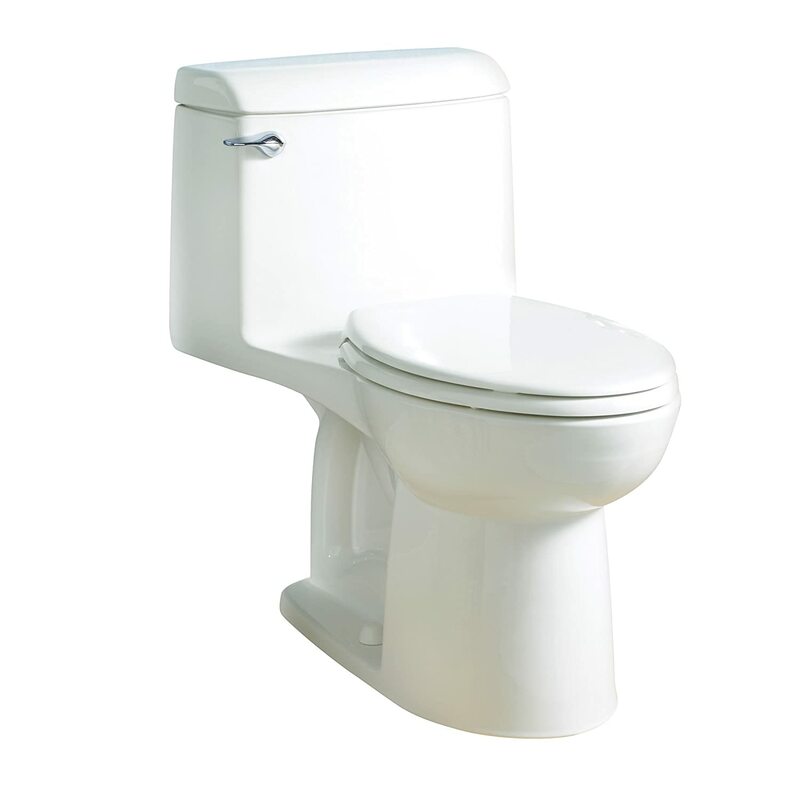 Bear in mind this Champion 4 is a 1.6 GPF one-piece toilet with a comfort height elongated bowl. The rest of the models in the entire Champion Collection are two-piece models. So wrong department if you are looking for the lower cost 2-piece Champion toilets here. Features like PowerWash rim, round bowl, and WaterSense labeled (1.28 GPF models) belong to the 2-piece category. Remember the question you asked earlier? Why didn’t they include the PowerWash Rim for this one-piece Champion 4? Well, since they started this Champion 4 toilet without it, merely changing the model number won’t magically add in the feature. They will need to start a new mold to have the PowerWash function since the tank is fused to the bowl. And why didn’t they build the mold with the feature in the first place? That’s a mystery only American Standard knows. But to be fair, even without the PowerWash rim, the bowl cleansing hasn’t lead to any disappointment. The other one-piece Champion 4 (model: 2004.314) is a standard bowl height model. Except for the bowl height, the rest of the features are identical with the 2034.314 model. And this regular height toilet flushes great with a MaP 800 rating. Similar to the comfort height model, the 2004.314, which also comes with a slow closing seat, is a replacement for 2004.014 without any changes in features, specs, and dimensions. This American Standard Champion 4 toilet has a rough-in size of 12 inches (the only size). The most common rough-in distance for a toilet in America. So likely that you will not need any adjustment or modification to have it replace your old toilet. Even if you have a non-standard rough-in, like 10 or 14 inches, fear not. You can always use an offset closet flange to fit this Champion 4 without issues. And it will work just fine when installed correctly. But it can be a little tricky to get it right. So if you aren’t sure if you know what you are doing, get a pro to help. And why should you even bother to install the closet yourself when you can hire a competent plumber inexpensively on Amazon Home Services. They will come on time and get everything done in an hour or so. You just need to make sure you have the toilet on hand when the guy knocks at your door. And they will remove and haul away your old toilet if you’d like. Check out Amazon Home Services for Toilet Replacement or a new installation. The disadvantages of this Champion 4 are typical of all one-piece toilets. So let’s not dwell on it. If you would like to find out more, you can read this article which compares one and two-piece toilets. While you will find that cleaning and upkeeping a one-piece toilet is easy, the exposed trapway can be a pain to clean. So it’s a pity that American Standard didn’t offer a skirted version. Otherwise, it would have been perfect. But there’s still this little drawback regardless if the trapway is exposed or concealed. That is, it can be a little challenging to press down the trip lever for users with some disabilities. Even though it is ADA compliant, this aspect of operation should be taken into consideration. The main reason for this issue is the larger-than-normal flush valve. The wider flapper has a higher water pressure on it, so it’s only natural it requires a little more force to lift the flapper to open the valve. Perhaps a spring loaded handle may be the solution to this problem. But since it complies with ADA’s requirement, it is probably not much of an issue for many. If there are other drawbacks, probably it lacks in more options. This one-piece Champion 4 toilet doesn’t offer a round bowl model. There is no option for an insulated tank if condensation is a problem. Neither do they offer the Right-Hand trip lever option if that’s important to you. And single flush leaves you with no opportunity to save some water when flushing liquid waste. One-piece Other than the ease of upkeeping, it is more durable than any two-piece toilet. And there is no way for the tank water to leak out and mess up your wood flooring. Elongated Bowl The men in the house can appreciate this feature more than a round bowl. 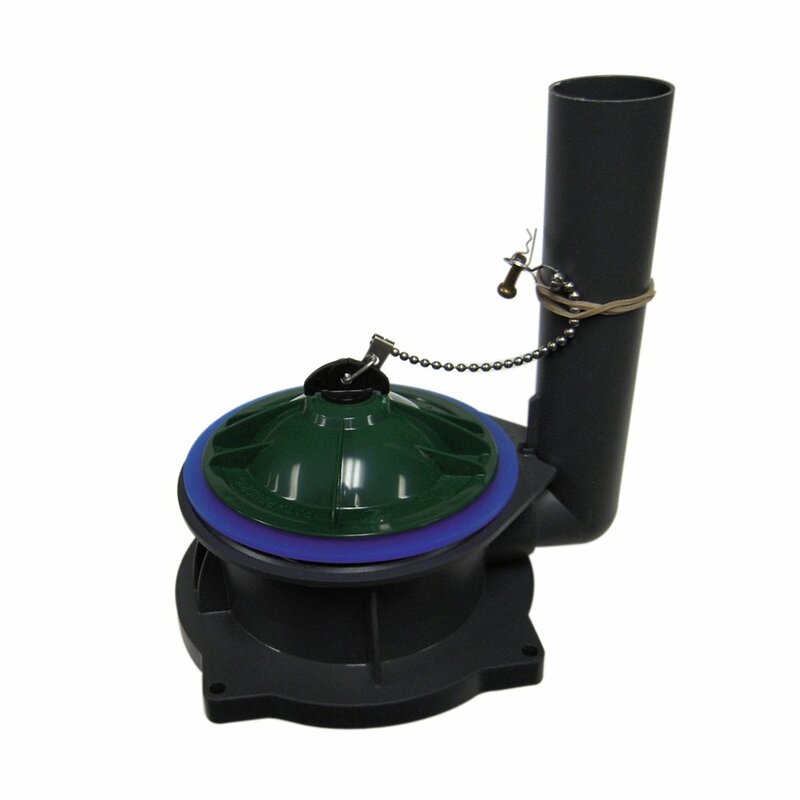 Largest flush valve and trapway Provides exceptional high flushing power that eliminates clogs. 1.6 GPF Though you may be using 20% more water than any 1.28 GPF toilets, the higher water volume provides a more thorough flush. Front-position lever handle Easy access from any direction. Soft-closing seat Included (previously sold as a separate accessory). If this American Standard Champion 4 crapper looks good to you, but you are still on the fence, it’s probably due to two reasons. The higher price may be one; the other could be the flushing capacity. Just like most one-piece toilets, it cost more than the two-piece Champion. But it’s not like a difference that is so great that puts you off straight away. Otherwise, you wouldn’t be undecided. With about 100 bucks more, you get to own a one-piece toilet with excellent flushing power and easy on the maintenance. Think of the time you can save (with EverClean Surface) and a cleaner toilet that doesn’t smell. That’s probably the best way to justify that little extra. But if the 1.6 GPF capacity is holding you back, then you are likely to give it up altogether. The trend now is towards a high-efficiency toilet (HET) which uses no more than 1.28 GPF. You may have seen the big 3 manufacturers adding more and more of the low flush toilets to their offering. The concern is, will they totally phase out all 1.6 GPF models eventually? That remains to be seen. The likely scenario will be, you are encouraged to change to a HET model instead of a mandatory switch. So, could this be the last opportunity to own a 1.6 GPF toilet? And not any one-piece toilet with standard features and specifications. This American Standard Champion 4 is unique with a rare 4-inch flush valve and a larger-than-normal trapway in one whole porcelain piece. Add to Flipboard Magazine.